One-time World Manager of the Year Arsene Wenger has to take huge credit for revolutionising the Premier League, according to Clarets goalkeeper Nick Pope. The Frenchman, who received the gong in 1998 following a league and FA Cup double, will take charge of his final home game for the Gunners against Burnley on Sunday, after 22 years at the helm. The former Monaco and Nagoya Grampus Eight head coach, the last of the ‘statesman managers’, designed the wheel for others to re-invent when coming to England – he was an innovator, a ground-breaker, a thinker. Wenger earned his stripes, gaining his mark of managerial immortality, when guiding Arsenal’s ‘Invincibles’ to a record of 49 top flight games unbeaten, passing Nottingham Forest’s total of 42 in the Seventies. He changed the way the game was played, broke bad habits, pioneered an age of sports science and introduced the likes of calisthenics and plyometrics in to his squad’s training routines. While illuminating Highbury with World Cup winners such as Thierry Henry, Robert Pires, Patrick Viera and Emmanuel Petit, adding the genius of Dennis Bergkamp in to that cocktail, the Islington emperor will have survived 1,235 games, with 705 victories to date, three Premier League titles and a managerial record seven FA Cups. Ahead of the trip to the Emirates Stadium, Pope said: “It’s a great stadium and it’s obviously Arsene Wenger’s last home game. “It’s unbelievable longevity from Wenger in the game. It’s something that you rarely see these days, particularly to that extent. We may never see that again. “From me growing up he’s always been the Arsenal manager; I’ve never known any different. “He’s a great ambassador for the game and for the Premier League. I’m sure it will be an emotional occasion on their end. Pope added: “The ‘Invincibles’ is something that we may never see again, that’s his stamp on the history of the Premier League that’ll be there forever. “That’s how big he’s been. With his style of play, when he first came to England he revolutionised the game. You can’t under-estimate how big a part he’s played. “I’ve always looked at the goalkeepers with Jens Lehmann and David Seaman. The ‘Invincibles’ season is obviously something that I remember, the Champions League final when they lost to Barcelona. 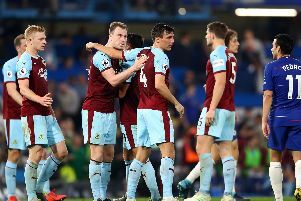 The 25-year-old won’t be getting drawn in to the emotion of the occasion, however, and with Burnley still holding an outside chance of usurping their opponents in sixth they’ll be going all out for maximum points. “There’s already a lot of noise around the game but we’ve got to go there and do a job,” said Pope. “They’re only one position above us so hopefully we can close that gap.